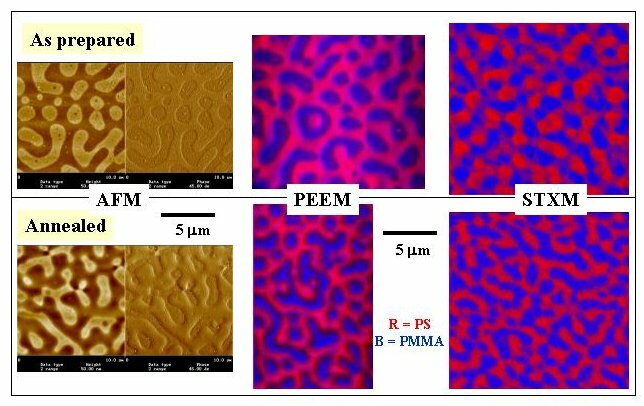 WHAT: Phase segregation in copolymer blends of polystyrene (PS) and polymethylmethacrylate (PMMA) has been studied using Scanning Transmission X-Ray Microscopy (STXM) to probe the bulk structure, and Photoemission Electron Microscopy (PEEM) to probe surface structure. Chemical maps of a 60+/-5 nm thin film of a 30:70 (w/w) PS-PMMA blend have been derived from PEEM and STXM C 1s image sequences. These are compared to atomic force microscopy (AFM) height and phase images in the figure. Both PEEM and STXM indicate the continuous phase is PS, not the majority PMMA component. The evolution of the bulk with annealing is clearly visualized by STXM.